Bill who is a licensed CCW (conceal carry weapon) holder was living his usual everyday life when one moment would turn his life upside down. As he was on his way to work Bill noticed that a disgruntled driver was driving aggressively behind him. The driver was tailgating Bill in an unsafe manner. So he decides to pull over to get a better understanding of why this driver was being so aggressive. As he came to a stop the driver tapped his bumper and quickly jumped out of his car in a race to Bill’s driver side door. Not trusting the situation Bill quickly drove off hoping to lose the driver. Unfortunately he caught up with Bill. So Bill attempts to take turns in order to lose the driver when he notices a police officer coming his way. The officer pulls Bill over while the aggressive drivers makes an abrupt U-turn to quickly flee the scene. As the officer approaches Bill’s driver side window he immediately he asks Bill if he has a firearm in the vehicle. Obviously this was a lie. Bill adamantly declares that was not the case. However, having a firearm in the vehicle is all the evidence that he needs to arrest Bill. He then had to pay $900 for bail, a retainer for his lawyer, pay additional fees and eventually court fees to defend himself. Although Bill had done absolutely nothing he still went to jail and had to go into debt in order to pay for legal fees. Unfortunately, this example is one of many reasons why concealed carry owners go to jail. Yes, there are some negligent reasons why some go to jail but other times it can be for false accusations. 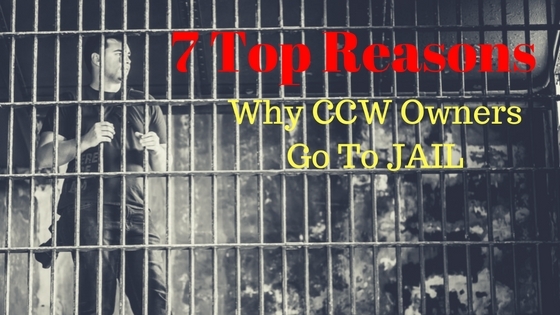 To help give others a better understanding I wanted to share some of the top reasons why concealed carriers go to jail. Some CCW owners have a misunderstanding of what their duty is as a gun owner. Having a CCW permit doesn’t license you to become a police officer or give you the power to enforce the law. Yet, there are cases where CCW owners will be witnesses to a crime and believe that they need to get involved. So they approach the criminals then fire a warning shot to detain them while calling the authorities. In response not only are the criminals arrested but also the CCW owner. Other times CCW owners will brandish their weapons when being involved in an altercation hoping that it will cause the other party to back down. Many times this just backfires and causes the CCW owner to be arrested. The only time a firearm should be discharged or brandished is if you are facing imminent death or great bodily harm. Simply brandishing your weapon during a heated argument is just idiotic. This reason is very important for those that travel often. You need to be aware of CCW laws in other states. Some states are super anti-second amendment such as California. If you get pulled over while conceal carrying or not having the weapon properly locked in a secure location then you can get arrested. They won’t let you off with a simple ticket. Some states are lenient so if you are just passing through and not stopping at an exit you won’t get arrested. However, I wouldn’t risk the chance. You need to research where you are traveling beforehand. Then before entering into those states you should buy a safe to keep the weapons securely locked into. However, some states will allow you to open carry in certain areas. For example, Florida allows you to open carry when going camping, fishing or hunting along with other activities. There is a big grey area in the wording. There is no clear cut definition of when the open carry can begin or end. As a result of that there have been many in the State of Florida who have been arrested. By standers and others that are camping or fishing may not fully understand the law. So when they see someone open carry they become alarmed and call the police. As mentioned in a previous point it is only legal to brandish or discharge a firearm if you are facing “imminent death or great bodily harm.” Being a victim of a home invasion or attack it is challenging to control your actions under stress with adrenaline rushing. CCW owners mistakenly shoot intruders or attackers in the back as they are fleeing. Not only can you face a felony charge in the situation but also civil lawsuits. There have been cases where the criminal sues the victim. Neighbors can also sue if bullets penetrate their living quarters. This is why it is important to get proper training for home defense. It would also be wise to have CCW legal insurance such as through USCCA. USCCA will provide you with legal representation and even cover a portion of or all the fees that you will face in court. As with Bill’s story many CCW owners have been arrested under false charges. In this day of age CCW owners are under attack by liberal politicians who are targeting the second amendment. There are many people that will not like you simply because you own a weapon. This is why it is important to be the grey man as much as possible. You shouldn’t let others know that you are conceal carrying. That wouldn’t be conceal carrying the smart way because it defeats the purpose of concealing. Many of us like to get on social media to brag about our weapons. We even go into other forums and groups to privately buy and sell them. Unfortunately everything that we do is being tracked by those that are anti-gun. The truth is that we can try as much as humanly possible to be the grey man but will still face false accusations. This is why it is important to have CCW legal insurance for the peace of mind alone. Yes you may never have to go to court or jail but the possibly is still there. Just like you may never get into a car accident but you still need car insurance. Many CCW owners assume that if they are not breaking the law then they don’t need to worry about being arrested or going to court. That is a foolish way of thinking. At a crime scene it is the police officer’s duty to investigate the scene. Anything you say can be held against you in the court of law. This is why it is important not to say ANYTHING without legal representation. When officers approach the scene you need to tell them that you invoke your right to plead the fifth. Then you should immediately call your lawyer. Unfortunately many of us cannot afford a lawyer. This is especially true for cases that involved a weapon. The fact is that most lawyer fees sky rocket when a weapon is involved. This is one reason why I love USCCA. It is just like paying for car insurance. As a USCCA member I know that I don’t have to come out of pocket to pay for a lawyer retainer along with the other legal fees. The challenge of finding a pro-second amendment lawyer is hard enough. I have peace of mind knowing that I can leave this all in the hands of USCCA. They have a network of lawyers in every state that is knowledgeable with gun rights and self-defense. Now this post wasn’t mean to discourage you from conceal carrying. The fact is that we live in a crazy world and it would be that much crazier without having an option to defend yourself. However, this post is really meant to encourage you to study your state CCW laws and to get CCW legal insurance. It may never happen but if it does then you will want to be prepared for your life to be turned upside down.